Cleaning can be tedious, even exhausting sometimes, unless you work smart! I have a collection of amazing cleaning hacks to make our daily job easier, including 16 Cleaning Tips That Will Make Your Home Sparkle, Amazing Cleaning Tips and Hacks to Clean Like A Pro, Secret Cleaning Tips From the Pros, you can check them out by linking through, these cleaning hacks will definitely revolutionize the way you clean your home! 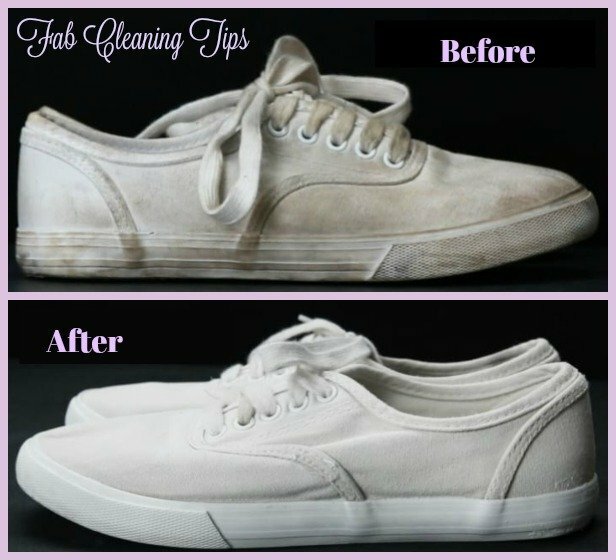 Since it’s Sneaker season, and many of us love to wear sneakers, bright white color, and cleaning the white sneakers is a big headache, I am going to share you an Easy Way To Clean Your White Shoes at home. Brush off your shoes to remove any big pieces of dirt. Mix a tablespoon of baking soda, 1/2 tablespoon water, and 1/2 tablespoon hydrogen peroxide in a small mixing bowl until it becomes an even paste. De-lace the shoes, and gently brush the mixture into the surface (you don’t need to press hard, just enough to brush away the surface dirt, and work the mixture into the surface). Add another coat by lightly painting it evenly over the shoe. Add the laces to the remaining mixture, and stir them in. Leave them out for 3–4 hours, or until the mixture is dry and cracking off. Clapping the shoes together removes most of the mixture, but you will need to go back in with a brush to get everything. The shoes should be several shades lighter. I share the following video because I need a good tip to clean the rubber sole, toothpaste is a good choice, and magic eraser is another, and in case you need to use bleach, I do recommend to use napkin or paper towel to cover inside and outside in the Sun, it’s my experience and you will see the difference after you try it.